A land of dramatic contrast. Soft, rolling countryside and forbidding crags. Industry and agriculture. Timber and stone. Concrete and steel. Let’s start at the great gates of Warwick Castle, not only among England’s most splendid medieval fortresses but also one of the country’s finest stately homes. Its story is brought to life by tableaux of wax figures in the Great Hall and State Rooms…and the torture chamber. The town has streets of spectacular medieval buildings. No need to ride naked through Coventry, like Lady Godiva, to admire the city’s spirit of regeneration after the horrors of the Blitz. Her ladyship’s 11th century legend is told at the Herbert Gallery and Museum. The 300ft spire and few remaining original walls of St Michael’s Cathedral are testament to the Second World War bombing raid, which left much of the city in ruins. A new cathedral, designed by Sir Basil Spence, was built alongside the charred walls and spire. It contains sculptures by Sir Jacob Epstein and a tapestry above the altar by Graham Sutherland. To ‘Brum’, as Birmingham is affectionately known. It grew as a powerhouse of the Industrial Revolution in the 19th century. Its civic buildings are fine examples of Neo-Classical architecture. Among them is the City Museum and Art Gallery. The city celebrates its engineering heritage at the Thinktank – the Birmingham Museum of Science and Discovery. And if you’re a chocoholic, beware. 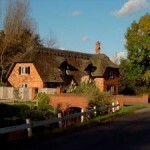 Cadbury’s Chocolate World, at Bourneville – a pioneering garden suburb built for Cadbury’s workers – is there to educate…and tempt. Another legacy of the industrial boom is the Birmingham Canal Navigation. At around 100 miles long, it’s the most extensive urban waterway in the world. Boat trips offer an insight to the amazing archaeology of the era. Up the River Severn into Shropshire to the Ironbridge Gorge. The museum here preserves the historic sites of the birth of the Industrial Revolution. The area is a shrine to Abraham Darby who, in 1709, developed the use of inexpensive coke instead of charcoal to smelt iron. His original blast furnace is the centrepiece of the Museum of Iron, not far from the world’s first iron bridge, spanning the Severn. We’ll take the river on up to Shrewsbury. The town is almost an island, enclosed by a great loop in the Severn. A forbidding castle of red sandstone, first built in 1083, guards the entrance to the town. It stands on the only section of land not surrounded by the river. Shrewsbury is a treasure house of medieval architecture. Stokesay Castle, near Ludlow, is one of England’s oldest fortified manor houses and has scarcely changed since the 13th century. It has a fine, moated garden. Into Cheshire, a county whose fascination lies in its historical heritage. Chester is a treasure house of medieval architecture, while Little Moreton Hall is one of the area’s finest ‘black and white’ houses – intricately patterned half-timbering on white plaster work. The region is rich in gardens. Among them, Norton Priory and Cholmondely Castle. The Midlands were once known as the ‘cockpit of England’, where momentous battles were fought. In 1642, during the Civil War, the Royalists defeated Cromwell’s forces at Edgehill, Warwickshire. Three years later, however, they were routed by the Parliamentarians at Naseby, in Northamptonshire. Earlier, in 1485, the penultimate battle of the Wars of the Roses, at Bosworth Field, near Leicester, saw the Yorkists defeated by the Lancastrians, paving the way for the Tudor dynasty. Wedgwood, Minton, Doulton and Spode…some of the names that put the Potteries on the map. Plenty of water, marl and clay, along with coal to fire the kilns, enabled Staffordshire to become a ceramics centre. Local supplies of lead, iron and copper were used for glazing. In 1910, six towns – Longton, Fenton, Hanley, Burslem, Tunstall and Stoke – merged to form what is known as Stoke-on-Trent. The Gladstone Pottery Museum, the Potteries Museum and Art Gallery and the Etruria Industrial Museum tell the Potteries story. 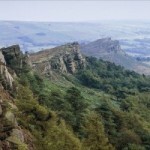 It’s time to lace up those walking boots and marvel at the Peak District. It became Britain’s first national park in 1951 and is named after an ancient British tribe called the Peacs – hill dwellers. In the south are the gently rolling, wooded dales of the limestone White Peak…a walker’s paradise. Dove Dale is a perfect example. To the north, west and east are the wild moorlands of the Dark Peak with its peat bogs and millstone grit, crags and caverns…more challenging. Try Winnats Pass, near Castleton. 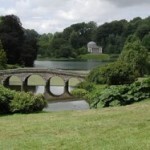 We’ll look in on two of the district’s great country houses. Chatsworth is one of Britain’s most impressive stately homes, built in the late 17th century for the 4th Earl of Devonshire. It’s bursting with fine paintings, sculpture and furniture and the chapel is resplendent with art and marble. The grounds and gardens feature a spectacular cascade that drops 200 feet to ponds and fountains. More subdued and, perhaps, more romantic is Haddon Hall, a rambling old house standing on the banks of the Wye. Much of the present hall is 16th century but it has kept many of its medieval rooms. 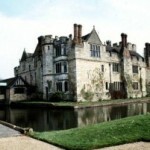 It’s the scene of a classic story of love and elopement involving the Vernon family, the hall’s 16th century owners. Buxton was developed as a spa town by the 5th Duke of Devonshire. More than 1,500 gallons of Buxton water surges from a spring every hour. It is bottled and sold around the world, although there’s a public fountain at St Ann’s Well. The splendid Opera House was restored in 1979. Matlock is another spa town. The beautiful Derwent Gorge leads to Matlock Bath and the cable cars that take visitors to the Heights of Abraham. West to Chester, on the River Dee, arguably the richest city in Britain for archaeological and architectural treasures preserved from Roman times. The walls of the Roman settlement and military headquarters – then known as Deva – are still intact and enclose the medieval Chester Rows. Here, shops line the first-floor carved wood galleries. There’s also a Roman amphitheatre. And so to Manchester, another city founded by the Romans to base their legions. Centuries later, cotton brought huge wealth to the city. As in Birmingham, the city fathers spent fortunes on civic buildings. The Neo-Gothic Town Hall, the John Rylands Library, the Royal Exchange and the Free Trade Hall are stunning examples. The dramatic Urbis museum – a high rise glass building – reflects the new Manchester. The contrasts to be enjoyed in this part of the world will certainly keep you on your toes.